Sport can have a positive impact on the lives of people with disabilities but many face challenges to getting involved in sport. Sport can play a key role in the lives and communities of people with disabilities, the same as it can for people without a disability. Over the past three decades, numerous studies have revealed that physical activity and sport participation result in improved functional status and quality of life among people with selected disabilities. We believe that one of the biggest barriers to participation in sport and physical activities is access to sporting infrastructure including services, facilities and equipment. We want to break these barriers and create new opportunities to increase participation. This programme activity is accessible to all with any kind of disability, providing the opportunity for individuals with different impairments to play football together, regardless of the limitations in play by breaking down the barriers they may face while trying to get involved in sport. Thistle Works also helps to improve their discipline, time- keeping, attendance, uniform skills and verbal/non-verbal communication, which are all transferable skills that they can take into their job-seeking or further education. This has also given them a network of friends. Sessions are run on a weekly basis – Every Wednesday @ Firhill Complex – 5pm – 6pm. The Trust also have two teams who are registered within the SFA PAN Disability league, which is a series of bi-monthly league competitions for young players with a range of disabilities. The Amputee Football pilot was launched in partnership with the charity, Finding Your Feet. Our open day was very well attended by people of all ages with our youngest participant (Daniel) age 7 and our oldest (Dot) aged 73. At present, adult amputees who wish to take part in competitive football need to travel to England to access teams / clubs and there is only one ‘version’ of competitive amputee football which is aimed at people with lower limb amputation. We want, in the future, to work alongside the SFA, Finding Your Feet, Disability Sport Scotland and other agencies to ensure that we can bring opportunities for competition to Scotland and also develop the sport for people with upper body amputations and those who wish to participate whilst retaining their prosthetic limb(s). Amputee football is in its earliest stages, however, we already have ambitions for adult participants to pursue coaching qualifications with a view to ultimately delivering the coaching to our younger members and also to act as role models for young people and adults who are experiencing difficulty in managing after a recent amputation. Indeed, one of the current group of amputee footballers has been approached with a view to delivering some swimming sessions for our younger participants. Also, the current adult attendees are ‘evangelising’ at group sessions in the amputee unit at the new Queen Elizabeth University Hospital in Glasgow about the benefits and opportunities of this work. Frame Football was developed when Frame Football Scotland approached PTCT asking for assistance in developing a service for frame footballers to participate in physical activity within the local community. Our pilot phase has already returned some remarkable results, with beneficiaries themselves and parents expressing amazement at kids actually standing without the aid of a frame and others developing softer skills of increased confidence and socialising to a level they have been unable to achieve in the past. As well as improving mobility and well-being, the benefits of peer support through football activity is evident. Frame Football Scotland are delighted at the way we have managed to use the expertise of coaches and the profile of the football club to develop and support the sport through its primary stages and look forward to developing this work further and embedding Frame Football as a realistic physical recreation option for all young people across Scotland who walk with the assistance of a frame. 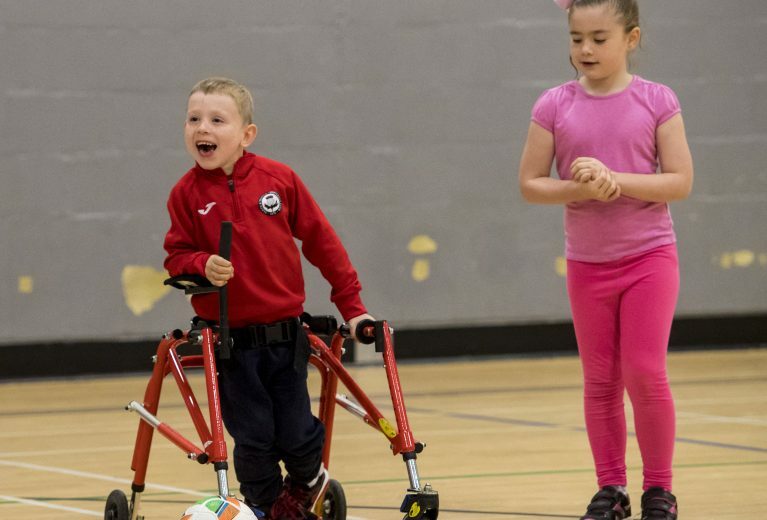 Frame Football currently runs on Sunday mornings from 10am – 11am at Firhill Complex. "I really can't stress how much this has changed James' life, it has made a great difference to his confidence and social skills, his class mates love hearing all about his goals and looking at his photos! We are so grateful to everyone involved at Frame Football for giving James this opportunity!"